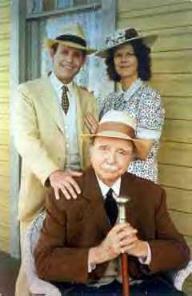 Peter MacNicol stars as Uncle Daniel Ponder in "The Ponder Heart,"
Holleman (Grandpa Ponder) and Brent Spiner (Dorris Gladney). he could easily be depicted as a simpleton. carefully, relying a lot on Peter's natural instincts about the character. sweet and innocent about thing other people may be cynical about. his wake a series of problems that everyone else has to solve, which is what this story is all about. MC: ...Peter has that kind of offhanded, joyful charm that Uncle Daniel needs. dialogue is always surprising and a little skewed, certainly, from naturalism. different from anybody we normally encounter. They're familiar and yet extremely exotic. and maybe the whole American South. knelt at her feet. It was a huge moment for him," [executive producer Marion] Rees says. MacNicol plays the lead role of Uncle Daniel. drama, so innovative. He would make suggestions on how a scene should go, and it was always better. He's another one who just lets things happen naturally, doesn't overdo it.'" Ponder Heart, particularly characters like Uncle Daniel and Edna Earle? EH: Well, I think Peter MacNicol [Uncle Daniel] had been in everyone's mind from the very beginning. actresses' interpretation or did the production allow them to experiment with their characters? could work with that in formulating and projecting his concept of the character. PBS ExxonMobil Masterpiece Theatre, American Collection, "The Ponder Heart"